(Nanowerk News) Researchers at the University of Southern California have found that sapphire surfaces spontaneously arrange carbon nanotubes into useful patterns – but only the right surfaces. They report high-throughput growth of highly aligned single-walled carbon nanotube arrays on a-plane and r-plane sapphire substrates. Such orientation control is likely related to the interaction between carbon nanotubes and the sapphire substrate, which is supported by the observation that when a second layer of nanotubes was grown, they followed the gas flow direction. These aligned nanotube arrays may enable the construction of integrable and scalable nanotube devices and systems. The findings were reported in the Journal of the American Chemical Society. As a substrate for the creation of single-wall nanotube transistor (SWNT) devices, sapphire has a critical advantage, said Chongwu Zhou of the USC Viterbi School of Engineering’s department of electrical engineering. 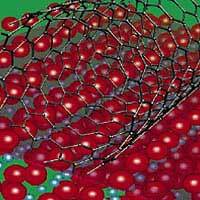 Single-walled carbon nanotubes will grow along certain crystalline orientations on sapphire. No template has to be provided to guide this structuring: It takes place automatically. Or more accurately, it sometimes happens automatically. With an elegant experiment, Zhou has resolved how and why this occurs. The process is potentially predictable and controllable, opening the door for systematic exploration of sapphire as a SWNT medium. Zhou said the understanding "may allow registration-free fabrication and integration of nanotube devices by simply patterning source/drain electrodes at desired locations, as the active material (i.e., nanotubes) is all over the substrate," to build such devices as sensors and integrated circuits for various uses. According to Zhou, nanotube transistor devices now have to be painstakingly positioned and aligned using methods such as flow alignment and electrical-field-assisted alignment and then individually connected. Experimental techniques can create some more extensive groups of tubes but "it remains difficult to produce planar nanotube arrays over large areas with sufficiently high density and order," Zhou said. He believes exploitation of the properties of sapphire his team investigated may allow production of the right kinds of dense, ordered arrays necessary. Sapphire is aluminum oxide, also known as the mineral alumina, the abrasive corundum, and when colored by small quantities of iron, ruby. It is readily available as a cheap synthetic. The self-guiding phenomenon was first reported last year by a research team at the Weizman Institute in Israel. Zhou’s team systematically investigated it. Certain vertical slices exhibit the self-guiding nanotube behavior. Another, parallel to the base, did not. According to Zhou, two possibilities might explain the difference. One would be the arrangement of the atoms in the matrix; the other, differences in the "step-edge" properties of the surfaces. Step edges are nanoscopic surface irregularities – minute rises from the surface level. To eliminate step edges as a possibility, Zhou’s group annealed (treated with high, long-lasting heat) samples of both forms, and then tested. Annealing emphasizes step edges and would accordingly emphasize the arrangement effect, if the effect was dependent on the edges. It was not. The basal, horizontal slices remained unable to self-guide nanotubes. Two of the vertical slices continued to do so. The behavior seems to be due to the varied arrangement of aluminum and oxygen atoms on the surface. Zhou’s team is now investigating the exact mechanisms at work, in order to further control the process. Zhou and his team have also worked with quartz substrates for nanotube synthesis, which did not exhibit any guided growth. Zhou worked with Xiaolei Liu and Song Han on the research, which was supported by an NSF Career Award, an NSF-CENS grant and an SRC MARCO/DARPA grant.